I have been going to the Belfast Gay Pride parade every year for the last 5 years. This year I thought I would make a sweet treat for me and my friends. Having looked up "pride cake" on Google images I thought I would have a go at creating a rainbow cake. Google image search is fantastic for inspiration or getting ideas to adapt for your own creations. So after sneaking a look at step by step photos that somebody had posted while in work, I went home intent on trying it out. I decided to start off simple. I threw together the ingredients for a vanilla cake and then pulled out 5 extra bowls to divide the batter between, one for each colour (I figured it would be okay to forego the indigo layer of the rainbow). I had varying amounts of batter in each bowl, smaller amounts for each colour. First in the pan was red (which was going pink so I added some cocoa powder to darken it down), then orange, yellow, green, blue and finally violet, making smaller layers as I went. I LOVED how it looked before I put it into the oven, I had used my new Americolor gels and they worked just great. I set the timer for 30 minutes and after the buzzer went I checked the cake with my tester, it still needed a good while before it was done, so I set the timer again... This went on for varying incr﻿ements of time until an hour had passed. The tester eventually came out clear and I put the cake on the cooling rack to cool overnight (it was 11pm by this stage). 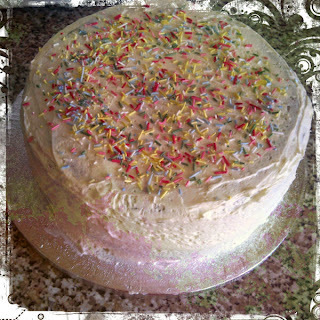 The next morning I got up and made a batch of vanilla buttercream and added my Americolor Bright White gel to brighten up the frosting and decorated the cake with rainbow sprinkles. I really am quite pleased with how it turned out, the colours still looked beautiful after baking. 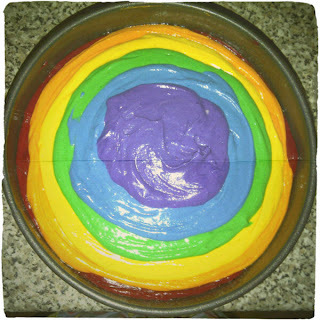 This could be replicated with any combination of colours, if the mixtures are added into the pan in a less uniform way the result will be more psychadelic, it could also be applied to cupcakes, though in that instance I would use piping bags to get the batter neatly into the cases. wow the colors turned out fantastic! What brand are the food colors you used? 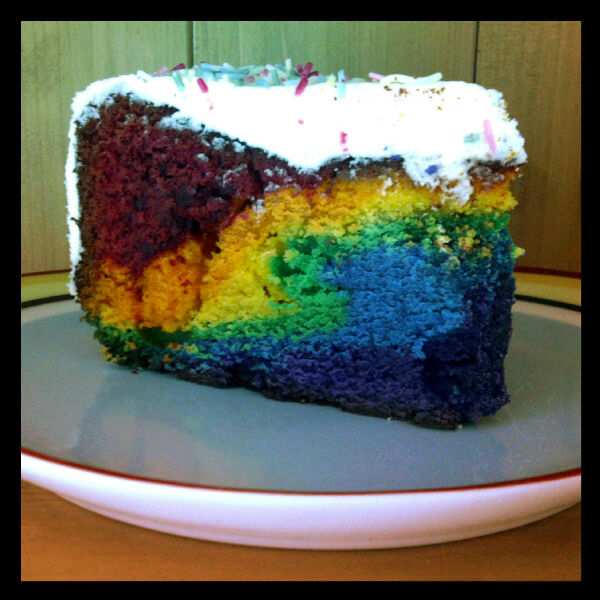 cause when i tried making a similar cake they came out weird.. I use Americolor gels. They are really fantastic, really concentrated so you don't even have to use a lot either.